Stevens Towing successfully pushed the Charleston Giant to Savannah, GA in order lift two (2) electrical transformers weighing in at 347 short tons a piece. 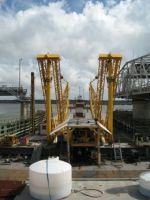 The trek to Savannah involved Stevens Towing’s tugboat captains to navigate 106 nautical miles of Atlantic Intra Coastal waterway and 7 bridges while pushing a 180ft x 82ft floating crane barge with a vertical height of 55 feet. The entire journey took 36 hours in addition too six hours to offload the two transformers from a container ship and load them onto a rail car.